BEAT THE ALLERGY BLUESEffective controlling allergies requires planning, skill and patience. Learn how we can help. DON'T LET ASTHMA KEEP YOU DOWNOur goal is to educate you on how to improve your quality of life and take control of your asthma. GOT FOOD?Did you know many foods cross react with others? BREAK THROUGH SKIN CONDITIONSYou or your child no longer have to suffer from skin rashes. We can help! ENJOY LIFE WITHOUT HIVESThere are many effective medications which can help treat hives and relieve itching. FIGHT INFECTIONS BACK!Many infections can be prevented with the right treatment. Learn how we can help. 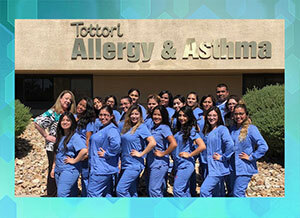 Welcome to Tottori Allergy & Asthma Associates. Our Institute is one of the leading centers for the diagnosis and treatment of adult and pediatric allergy, asthma and immunologic disorders. Our goal is to provide the highest level of patient care while maintaining a successful and comfortable patient-physician relationship. 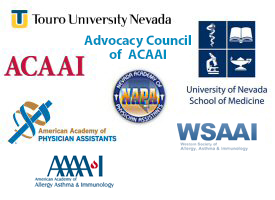 Dr. Tottori is board certified by the American Board of Allergy and Immunology. Our offices are conveniently located throughout the Las Vegas Valley on the East and West side of town. We look forward to welcoming you to our practice. We invite you to contact us to request an appointment by calling one of our offices: West Valley Location: (702) 240-4233 East Valley Location: (702) 432-8250...or by filling in the form on our Appointments page. We look forward to hearing from you! Our friendly and knowledgeable staff is here to serve you and make your visit a pleasant experience. We take the time to understand your needs and make sure to find solutions. We offer services in Spanish, Tagalog & Chinese (Mandarin).